“There’s no blood on the pulpit this morning.”This is what Mabel Boggs Sweet, mother of Leonard Sweet, the author of Giving Blood: A Fresh Paradigm for Preaching, would say if she were listening to a bad sermon. Mabel Boggs Sweet was a preacher herself and, therefore, had earned the right to make such an assessment. But then, don’t all of us who listen to a preacher’s message make a judgement every week about what we have heard? What makes a sermon bad or good? Why is it some preachers can make us levitate with joy as we listen to them, and some make us want to leave the building through the closest exit? And especially in this visual age, how can a preacher deliver a dazzling, image rich message? Is there a way to preach to and reach this generation of sermon listeners? A word about the organization of the book. Sweet uses blood as a metaphor throughout his book as the framework for the content. The title, sections, chapters and “labs” are all identified with names that are related to blood: blood types, streams, flow, cells, vessels, thinners, poisoning, etc. Rarely does a metaphor lend itself to such broad use without breaking down somewhere. Yet in Giving Blood the metaphor of blood holds up throughout the book’s entirety, and in all its applications. Many people consider the use of the word “blood” to be politically incorrect and offensive, and therefore to be avoided at all cost. Sweet mentions in the Introduction that he did his best to come up with another more suitable less controversial metaphor for preaching, but could not find one. “Something kept pulling me back to this biological symbol for life and the organizing symbol of the Christian faith. The metaphor kept me in its grip no matter how hard I tried to wrestle free. What you hold in your hands is my surrender and my limping free of that street fight.” I believe the reader will see that using blood as the metaphor for preaching in Giving Blood was not only the right choice but its use brings unity to the many facets of the topic in an ingenious way. For anyone who is interested in sermons and preaching for any reason, including critiquing a weekly sermon, I recommend reading Giving Blood: A Fresh Paradigm for Preaching. Even as a layperson, it was a fascinating and enlightening book. Full disclosure: I am not a preacher, pastor, elder or deacon, but I do participate in a weekly church service. I read an early version of this book. My opinions are my own. N othing is more intriguing, in my estimation, than to learn that an ordinary, everyday object has the potential to be transcendent. In his book From Tablet To Table, Dr. Leonard Sweet opens up the table to display the power this ubiquitous piece of furniture has to be just that – transcendent. No matter the make-up of your family – single household, community, or church; no matter the type of meal served – PBJ sandwiches, drive-thru service or potluck, Dr. Sweet tells us the family table has the potential to become a positively transformative place for those who gather around it. It was hard for me to imagine that the table, or the lack of it, could matter so deeply to the culture or to the church. It was especially surprising to discover the pervasive connection the church has with food, and to learn that it was Jesus who led the way into this “open table” foodie lifestyle. I never really considered the idea that Jesus’ dining pattern became a faith-forming experience with his disciples, and their enjoyment during meals may have looked pretty suspicious to the Pharisees, which is probably why they accused him of being a “glutton and a drunkard, a friend of tax collectors and sinners.”(Matt 11:19) From Tablet To Table covers these surprising and engaging ideas, and many more. Presently, as far as the Western Christian church goes, there is a lot to be concerned about regarding the table says Dr. Sweet. Quoting Jean Leclerc’s definition of the gospel, “Jesus ate good food with bad people,” Dr. Sweet points out that it was the table that shaped early Christian worship, as we see in the Last Supper and the post-Resurrection meals Jesus shared with his disciples. “Food is a building block of our Christian faith. We are part of a gourmet gospel that defines itself in terms of food and table. Yet we find ourselves at a juncture in history where we have lost the table…” The culture of today is also feeling hunger pangs for the table, and this is noted in several places in From Tablet To Table. One example is a list of “quantifiable negative effects both physically and psychologically” on families and kids due specifically to the loss of the table. These include a negative impact on shaping vocabulary in young children, and in combating childhood obesity. On a positive note, another bit of data suggests that sitting down to a family meal three times a week can cause a student’s performance in high school and college to skyrocket – just three times a week! When I think of all the time I put in to making sure our kids had access to special lessons and practices and performances that were expensive and long distances away, it doesn’t seem so impossible to get together for an inexpensive meal at home three times a week – especially if it could mean a better chance for kids to do well in school. The table… the family table. Who would have thought that it carries such power, and potential and promise? Who would have thought of it as transcendent? Well, Jesus did, it seems. He spent a lot of time around one, and he also made a sacrament out of bread and wine, as Dr Sweet reminds us in his book. Here is a quote from Dr. Sweet’s book that I love that may whet your appetite: “First commandment and final commandment to humans in the Bible? ‘Eat freely’, Gen 2:16 NASB, and ‘Drink freely’, Rev 22:17. Everything in between these two commands is a table, and on that table is served a life-course meal, where we feast in our hearts with thanksgiving on the very Bread of Life and the Cup of Salvation: Jesus the Christ.” Why you should read this book in less than 140 characters – From Tablet To Table by Dr. Leonard Sweet is rich, rare, filling and satisfying reading. Help yourself to a copy and enjoy every morsel. What does the phrase “new normal’ mean, anyway? It seems that “new normal” has been applied to almost every aspect of our culture since 2007, when the US economy faced its most challenging downward shift since the Great Depression of the 1930s. To my way of thinking, “new normal” carries a negative connotation. It means that our robust American quality of life has taken a big step backward, and it is not going to return to its previous, presumably healthy, levels of enjoyment or accomplishment. Therefore a different, less vital, more difficult way of life has ensued which is here to stay, so get used to it – this is the new normal. The Church has certainly experienced its own downward shift over the last decade or so, with yearly membership numbers declining in all mainline Protestant churches, and disdain for Christian beliefs and values being the norm in our culture. Is this the Church’s “new normal”? Dr. Ingram’s book helps us to consider this question. 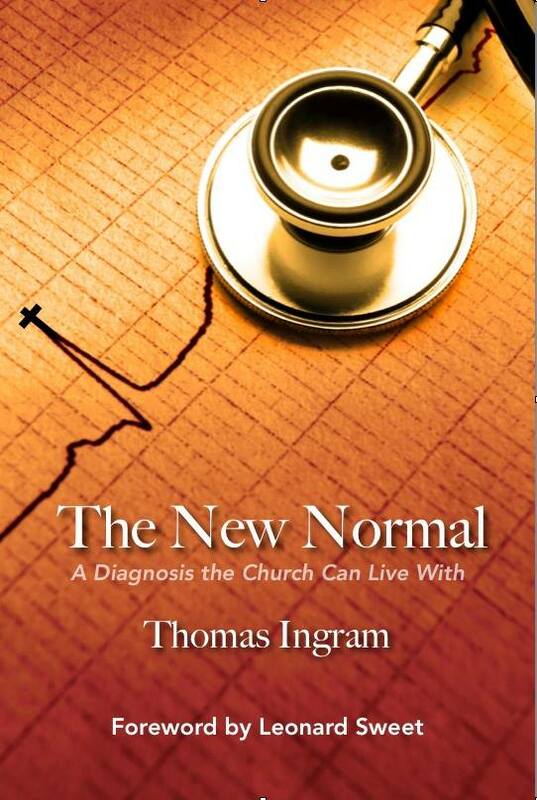 In his book, The New Normal – A Diagnosis the Church Can Live With, Dr. Tom Ingram demonstrates that skillfully researching a patient’s health history, ordering appropriate tests, determining a diagnosis and designing a treatment plan to establish a “new normal” for an ill individual can be life changing for the patient. Dr. Ingram also uses this medical model to evaluate the ailing 21st century Christian Church in America. In his concise and witty book, Dr. Ingram observes the Church’s overall health, both by looking at some of the history of the Church’s past challenges, and also by using data collected from a website he created recently called the tenthingsproject.com . This website provided a space where non-Christians could vent their frustrations with the Church and Christians. In compiling and comparing the past and present information in the church’s health history, Dr. Ingram skillfully helps us see the parallels that exist between the health challenges of an individual, and those of the post-modern church. In the book we read that this same question, “Are you ready to get better”, can be asked of the Church. Dr. Ingram emphasizes this point by relating the story in John, Chapter 5, in which Jesus says to the paralyzed man by the Pool of Bethesda, “Do you want to be made well?” Amazingly, the paralyzed man does not answer Jesus with a clear “yes”. How puzzling. Why wouldn’t the man eagerly say yes? Could it be that the afflicted man is not ready to change? Perhaps he does not want the dis-ease of being made able bodied, and therefore held accountable for his actions? Might the Church have the same paralyzing affliction, and be hesitant to get better for the same reasons? Is the Church’s “new normal” one of inaction and powerlessness in our culture? Not necessarily, according to Dr. Ingram. The Church can still chose to be obedient to the One who is our source of life and health, and with the Holy Spirit’s help, we can initiate service to the ones most in need, most alone, most marginalized in our communities, and there bear good fruit to the Lord. In the chapter called Treatment Plan, Dr. Ingram offers some ideas for activities to get Christians moving, active and involved in rehabilitation, knowing that when we have served “the least of these, we have served the Lord.” In this way, it might happen that followers of Jesus could turn the idea of a “new normal” in the Church from a negative to a positive statement. Will this rehabilitation be easy – no. Dr. Ingram admits that asking the post-modern person to exchange self-absorbed living to sacrificial giving is only possible because “with God all things are possible.” Matt 19:26. He states that the powerful inducement for this change is that the way, truth and life of Kingdom living, the person of Christ, is “with us” in all that He asks us to do in obedience to Him. We aren’t left alone by the One who assures us, “I am with you always, even to the end of the age.” Matt 28:20. He will be with us as we follow Him in the way, he will enable us to see Him as the truth we need to guide our choices, He will ultimately be our source of life during the tough times. He will be our “new normal” and our source of joy. That is definitely a “new normal” the Church can live with. 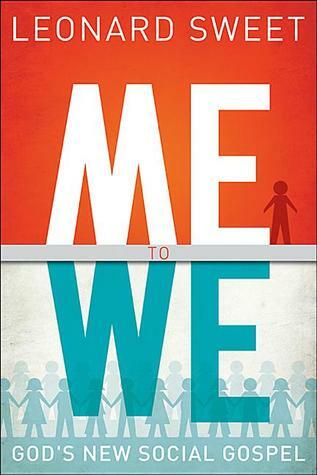 ME and WE — God’s New Social Gospel is a lively and lovely introduction to a re-imagined, metaphorically rich present/future church. This church, Dr. Sweet contends, must learn how to face three of the biggest challenges of today’s culture: individualism, racism and consumerism. The title of the book does not prepare the reader for the beauty contained within it. I must say the book is beautiful, in many ways. First, the book is beautifully planned: It is presented in three short parts. Part I is about the Me/We Gospel – A Biblical Story; Part II is about Me/We Creation – A Birthing Story; and Part III is about the Me/We Economy – A Garden Story. Second, the book is beautifully written, especially Part II, which is a deep and meditative look at the need to sever the identification of black with evil and white with good. This imagery runs through the “whole range of human behavior”, according to Dr. Sweet, and deserves our honest attention as well as our best, prayerful efforts at correction. Third, the book is beautiful in its application. Using the symbol of the menorah, Part III offers a seven-branched view to incarnating light and life giving practices. The emphasis is on relational theology and individual responsibility as we live together in God’s House and Garden communities — our churches. I have been reading Dr. Sweet’s books for many years. He is a brilliant thinker and writer, and there is no missing the fact that the Lord Jesus is preeminent in everything he produces. But this book took me by surprise. I believe it is not only one of the most beautiful books he has written, but it may also be one of the most important.